Greetings everyone! Before I begin this channeling I would like to explain what has been happening. As I spoke about this, in my previous message to all of you, many of us have been working on removing the old matrix system. And as many of you have later shared with me you too have been involved in this decision making and carrying out of this plan. You too have seen the spider webs and the spiders. You too have seen the destruction of the spiders, etc. That is precisely what has happened in the last few weeks and will continue to only spiral in its intensity. To help you understand what this means is this. We are all living in a world which was created by our own selves, the source, angels, our benevolent cosmic brothers and sisters many eons ago, in order to give us, a playground if you will, to experience a world of love and light in a three dimensional setting. I talk extensively about this in my book Mission to Earth, so I won’t go into detail here. What I will say is that there was a matrix that was put together in order to keep this reality intact. There is a lot that goes on behind the “scenes” so to speak. So much is happening, so many beings are working around the clock to assure that we are safe and sound living here on this spaceship earth. And our planet is not stationary, it is constantly in motion, it is not revolving around the sun as we have been taught in school. It is constantly moving, and now that the new age has begun, our planet has actually changed her trajectory as I have explained in my previous channelings, and not only me, if you look online you will see many talking about this. And if you look into your heart you will know a lot more. That is why so many are reporting seeing 2 suns on the horizon. Because we do have 2 suns, our original sun is moving further and further into the distance as planet earth continues her upward spiral motion home. For those of you looking for scientific evidence, you will not find any, because those in the know are trying their best to hide this information to avoid severe panic that may ensue were people to find out the truth about what is happening. The galactics understand this all too well and that is why everything is revealed to us in stages. That is why you will most likely find this type of information from various channelers and simply by observing the sky, listening to your heart and truly tuning into your own wisdom. So our earth has changed her trajectory, please understand that it will take years upon years upon years until earth is finally out of the system she’s currently in and until she reaches home. We will be in the photon belt for 2,000 some years, and starting now things are only going to improve. However, it will not improve instantly, as there are just too many false beliefs and too many false paradigms that our human minds are plagues with, our DNA is plagued with, and the earth herself must shed. That is why there are so many of us here right now on earth working on cleansing everything out, and restoring the peace and harmony and most importantly releasing the OLD and instituting the NEW. So going back to the whole matrix situation. There is a matrix that the earth is on, which really is a system of encodings. What has happened is that another matrix was created within a matrix by the “dark side”, human ego, reptilians, archons, etc, etc, all those who wanted to take advantage of the amnesia that humans are under in order to harness the energy from this planet. So, what has happened and what we are being told in the channeling you will see below is that the old matrix has been quarantined; the intricate web of global control by the darkness has been put on hold. And a new matrix put into its place in order to sustain our physical experience, and allow us to continue existing in this reality, but this time being supported by tremendous amount of creative energies, loving energies, and energies of light. The point here to understand that instead of destroying the old, what has happened is there was a shield placed between the old energies and humans and a new energy grid put into it’s place. To help you understand this better, it’s like this. Imagine that you have a cup of coffee and you want to wash that cup, but instead of going the traditional way of pouring out the coffee and then washing the cup, you simply put the cup which is already full of coffee under a stream of water. As the clean water pours into the already full cup, it pushes out the coffee and moment by moment you see that the coffee is gone and only a few particles remain. That is precisely what is happening with us. All the new energies that are coming in, and especially with the new matrix, we are put under pressure in order to PUSH OUT everything that doesn’t belong. Because, ascension is a personal process, but because we are all ONE and are so incredibly linked to each other, it then becomes a collective process. And it’s simply not possible to completely destroy something in order to build something new. That is the old paradigms of thinking. A new way of thinking is instead of destroying the old, you are simply to institute a new energy into your life. Instead of thinking about something negative, you need to shift your consciousness into thinking about something positive. Everything carries both polarities, and right now at this moment we are given a great opportunity to experience BOTH and to choose how to react to any given situation. That is why so many of us, including myself are going through these cleansings. Until we clear everything out from our system, we will continue to be in this sea-saw experience. And as I keep saying whatever is happening on the micro level is happening on the macro level. Whatever turmoil we are experiencing within our own selves. The very same turmoil is being experienced on a more global scale. Coupled with various energies that are nearing our planet, we are going to be put through the tests, so much will be and already are changing in our lives. You will be finding yourselves in various situations, and once again it will be your choice on how to react to them. You will be put into situations where you will be literally forced to say goodbye to various people in your life (and many of you are already reporting this), you will be moved from your jobs, you will be relocating somewhere else, you will feel the need to shed, let go, release, and start anew. All of the old thinking patterns will re-emerge. You will find yourself wanting to walk away from spirituality all together, there will be a tag war going on in your psyche, between your EGO and your HIGHER SELF. What is important here is to keep in mind that there is no war, you are not to fight with your own self, you are simply to become an observer of your feelings. Observe what you are feeling, do not fight anything that comes over you, even if it is a truly petrifying thought, simply allow it to pass out of your system, observe it , think of why it has bothered you to begin with. Learn from it and let it go! And remember, just because we are from the stars and are here to spread the love and light, does not mean that we do not have our own “human” issues to work out. After all we have been exposed to this way of life for many years, and we too must clean our palate, work on our own selves and keep moving forward, always remembering where we have come from, and who we are. That is the key to getting through these difficult situations. Remembering your divinity, and your powers. That is another point that I wish to draw your attention to. I know that this is becoming a rather long message, but I feel its very important for me to remind all of you about your own powers. After the Avalanche portal, and the Golden Particles of God portal, and the institution of a new matrix system, we have been infused with a lot of creative energies. Which means that whatever we think of will materialize much faster than ever before. And that means that if we focus on negativity we will literally be creating this negative experience for our selves. So be mindful of what you think, and always remember to observe, examine, and release. Remember to practice the cleansing and protective techniques. Remember to ground yourselves as much as possible. Also and this is INCREDIBLY important to understand. Most of us here on earth are here to transmute the so called “darkness” into the light. From time to time we are given breaks, downtime, in order to deal with our own “issues” that we’ve acquired here on earth. However, now is not one of those times, as we are once again called upon to stand true to that which we are. Transmuters of various frequencies and portals of new creative energies. Therefore, many of you in the weeks to come will find yourselves surrounded by various “odd” energies. Please understand that you are to stand true to your convictions and you are to remember that you are DIVINE, POWERFUL, beings of light. I can’t stress this enough, that you are ALL VERY POWERFUL. Therefore, no matter what energies are around you, know that YOU CAN TRANSMUTE whatever it is that you do not like into what you wish it to be. It’s highly important to remember this, and even more important to UTILIZE YOUR POWER ENERGIES. Simply by reminding yourself and using these key words “I AM THE VIOLET FLAME”, “ I AM THE GOLDEN PARTICLES OF GOD” “ I AM DIVINE” “ I AM THAT WHICH I AM”. As well as a very powerful chant “OM”. Do this change three times and you will feel your body vibrating and quickly recalibrating your energy field into balance. Use whatever you have as your arsenal. And for those of you who have AA Metatron’s disc, please continue to carry it with you wherever you are. Wear Black Tourmaline and/or Shungite for added strength. So having said this, here is a channeling that I have received. I love you all, thank you so much for being here right now. Thank you for being who you are. Thank you for your light and your love! 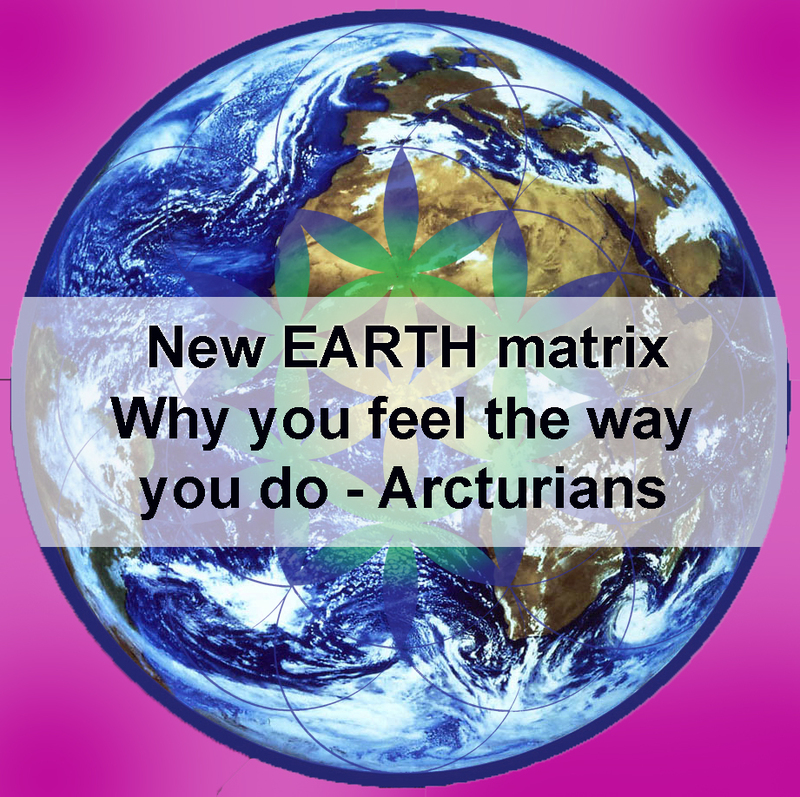 “The creation of the new matrix earth has indeed been instituted into the new reality structure of your being. For the new matrix of the creative powers that have indeed been harnessed from the benevolent structures of that which you all are, have been spun into existence. The old matrix of which many of you are so very much familiar with, has indeed been quarantined until further notice. Has indeed been quarantined and for the purses of retrieving the ancient structural information. The new matrix which as indeed been instituted into your present reality, shall allow those of you ready to partake of the tree of life, those ready to partake of the tree of knowledge to step confidently towards benevolently achieving all that you have indeed come here to achieve. The benevolence of the new matrix system, shall allow many of you to remain intact on this planet, whilst you continue to operate on a new frequency transmuting the energies of the past into light. And so we wish to draw your attention to the fact that many of you shall continue to experience an increasing level of awareness, increasing level of awareness not only of the benevolent, but also malevolent energies swirling before you. For the energies of the past, the energies of the old structure of being are indeed being released and are to be transmuted by the benevolent energies that you all shall activate within the core matrix of your being. For within your structural grids, within the components of that which you are is a code, which has found its way into your everyday creation. For the codes of which we speak shall begin to make itself known to you within the next few months of your earthly time structure. For the new year of your earthly timeline shall greet you with magnificent changes not only throughout your known world, but within your very own lives. For the phase of which you all have been informed has indeed begun to unfold rapidly on your earth. The phase of benevolent co creation of that which you wish to see in your world. And so, we must remind you to diligently acknowledge the contractual obligations, that you all have signed up for upon your entry into this planetary system. For the contractual obligations of unconditional pure love shall ring true to your ears once more. For you shall all be reminded of that which you have come here to achieve. You shall all be remind of that which you are all here to bring to humanity. Understand that the changes rapidly unfolding within your structural being are necessary, understand that you shall encounter energies never before experienced in your present incarnation. Understand that you are immensely powerful beings and are holding the keys to deciphering said energies, energies which shall be presented to you in your waking hours. Energies that you shall not be able to comprehend through your physical human mind alone, and yet your heart code shall decipher the meaning of said energies at lightning speed. Understand that you are loved beyond measure by all that is, understand that you are indeed being supported by the benevolence of the creator. Understand that you are indeed a being of magnificent proportions, for indeed you hold the power and indeed you hold the key to the universe. Understand and know that you are being supported by all that is. Stay in the light and know that the benevolent power residing within the core structure of your being, shall begin to emerge rapidly for you now. Understand that the sensation of such power shall leave you questioning everything that you thought you are. Understand that wielding such power for benevolent purposes is the only outcome that you shall allow to permeate throughout your being. Understand that with great power comes great responsibility, and know that starting this moment all that you wish shall materialize rapidly into your incarnated reality. Know that it is so, for it is. love to you Anna, and yes thank you so much . Thanks anna just received your book, alot of things I have been shown are becoming much clearer now! Was shown a circle of people with flames for heads, they were in a circle, they opened up and I walked through to the middle were there was an enormous black spider much bigger than myself but it didn’t frighten me. This vision puzzled me for sometime. Do you have any comments much appreciated. Thank you very much for sharing! Namasté!! What if.. I told you I was told I’m apart of The Galactic Federation Council I wan told it has to do with our Earths Spin….? Reblogged this on Indre Balanse. Reblogged this on Helena Calhoun's Blog. Very simply put, as I have order my The Lord to share and many of the FB friends THINKG I am contemn ing ,but I am not, I simply obey . We must clean our hearts from everything that we thjng we know ,but we don’t. The prove is that no one person has manifest divine NATURE ex she’s the mind or ego has been seating in the heart. And together,,, heart and mind ,pritent. To love,and know God ,and spiritual understanting ,but we have ALL come short of the divine living. Now the LORD is restoring !what we have failed to be as he is holy !and for that he is sanding thr trumpet of his message so that we ALL my clean our heart and surf get to the soul with in. I know many don’t like what I am sharjng ,but is not me but The Lord that love all. Many like bad have delete me ,mut I still love you ,it’s my divine nature. I can’t help it. I have been meaning to blog about the rollercoaster I often feel I am on. I felt it was important to share that while I hear people tell me how enlightened I am, I still get frustrated. I’ll sometimes get angry at traffic, or a computer that won’t cooperate, and so on. I realize what is happening, but sometimes it just comes over me and out comes the anger. Whether it is my own, or something from the collective doesn’t really matter. It’s normally quite fleeting, and I get over it, but just when I feel I’ve reached a new level of enlightenment, I end up riding the rollercoaster down to the bottom again. It is in those moments when I wonder if I can make it all the way to ascension. Then I remember just how high the high points are, and I have no question that I will not only get there, but that I’m already there in most ways. I like the messages in this post from Anna and I think it’s valuable information for any light worker. Thanks Anna! in my early to mid twenties I was in the 3rd 4th realms. I have met aliens, seen their space ship people being beamed up. I had an evil reptilian jump on my bed to scare me. I have been to dark places outer space lost cities, etc. the all white beings I am not sure the race, came to me in peace and stood there looking at me with interest and kindness. I have had greys come to my room many years ago. They just showed up. they didnt hurt me or anything. I am guessing the moral code for all aliens is good/neutral/ and evil. Michael the arch angel has rescued me from demons in my room many times. I have met Thor the hero of norsans. he is a good Nephilium giant killer. I have seen a city where giants were roaming. One giant bumped me on the head in the mall I woke up and my head hurt. Now that I am much older 33, my divine powers have weakened from my mental issues and anxiety and lack of sleep. I have met pokemon which come back to the earth eventually they are loving and peaceful. I love my dreams I would love comments and feed back God bless. Very insightful, thank you. My husband and I have seen a reptilian tail in the flesh and are starting to experience more and more of what we are trying to understand. Thanks again!